Happy spring, friends! We haven't been graced with spring-like temps quite yet here in Raleigh, but honestly the cold weather has been beneficial for getting some indoor projects knocked out, like our kitchen! 1. Dark countertops are the worst. They show every crumb and every spec of dust. After making a sandwich on our black laminate counters, I knew that they would drive me crazy, so we modified our plans to include new counters. 2. This kitchen doesn't have a pantry. We could work around that for now, but down the road if we have kiddos or sell the house, I can see a kitchen sans pantry being a problem. 3. Some of the cabinets were starting to fall apart. We hadn't really noticed during our initial walk-through, but the 20 years of wear and tear on these cabinets were starting to show. I got a quote to paint the cabinets and it came back at $1600 (!!!) and even the painter wasn't convinced the old cabinets would look great afterwards. At this point, it made more sense for our timeline to go with new cabinets. 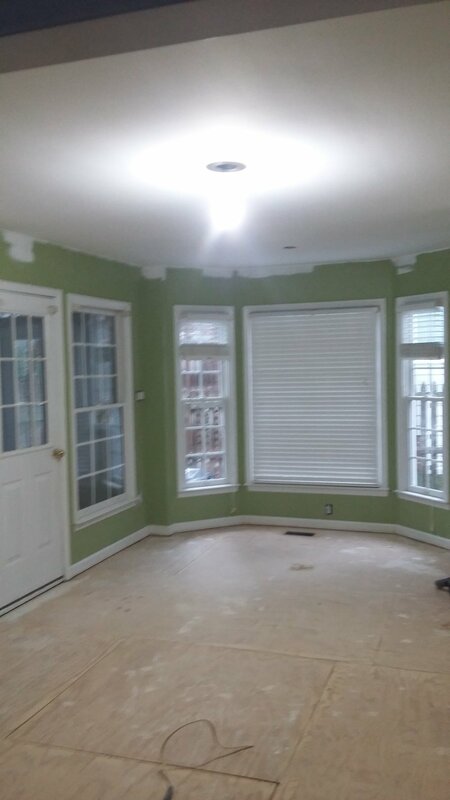 Oh how a renovation can snowball. We were just going to spruce up the kitchen - you know, some paint here and there - but then we ended up gutting it to the subfloor, haha. Voila! I spent WEEKS coming up with a new cabinet layout. 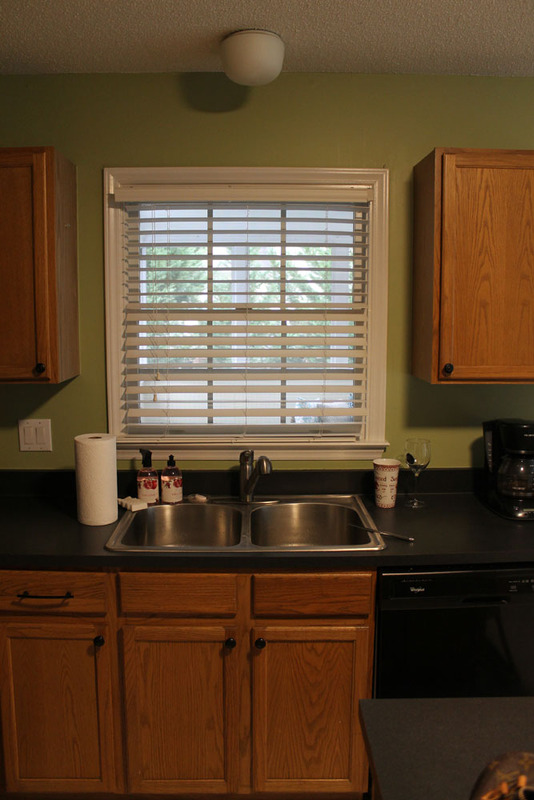 Since we were incurring so many additional costs with new cabinets and counters, I didn't want to add more to the budget by having to move electrical or plumbing, so I had to be very careful with the new layout. We kept the basic footprint, but shifted things over in places a few inches here and there to try and maximize the flow in this small kitchen. Trying to add in a pantry and not move any outlets or water lines was a challenge, but I love the new layout and how the kitchen functions now. The kitchen doesn't get a lot of natural light, so the dark oak cabinets, black appliances, and dark paint on the walls were not doing this room any favors. 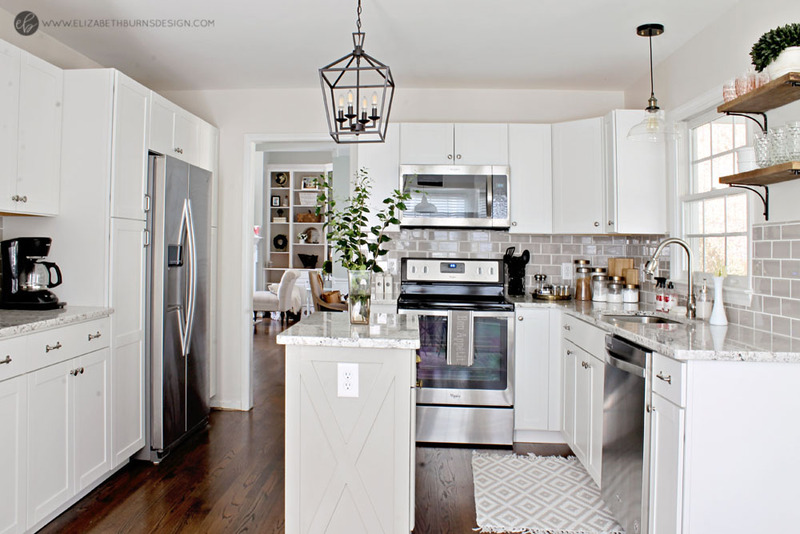 Although white cabinets are not anything super trendy, I knew they would brighten up the space and would be something I wouldn't get sick of in 10 years. We went with the Arcadia white shaker cabinets from Lowe's (again) because we've used them before and liked the value of the line. One change that I think really helped to open up the space was removing the upper cabinet from the right side of the window and replacing it with open shelves. I love having a spot to showcase some of my prettier glassware and it makes the kitchen feel a tad bit bigger. The wall of cabinets below is why we ultimately decided it would be best to go with new white shaker cabinets and create a pantry. We did sacrifice some counter space, but the prep area we lost wasn't super functional to begin with because it's right next to the doorway leading into the dining room. Luckily, the fridge water line and outlet were closer to the left side of the appliance, so when we moved it over a foot, they are now smack dab in the center of the new counter-depth fridge (another space-saving, albeit pricey, change). The outlet on the far right ended up in the pantry, but I think that's a good spot for a charging station or even for a small appliance. By flanking the fridge with pantry cabinets, we didn't have to create a fridge cabinet, which was a welcomed change! I think our DIY pantry is my favorite part of the kitchen renovation. Another small tweak we made was the size of the island. Before it was 24"D x 30"W and really cut into the clearance in front of the dishwasher. You could barely open it up all of the way, let alone walk around it. We swapped the old island out with a new one that measures 18.5"D x 36" to create a wider walkway without sacrificing counter space. 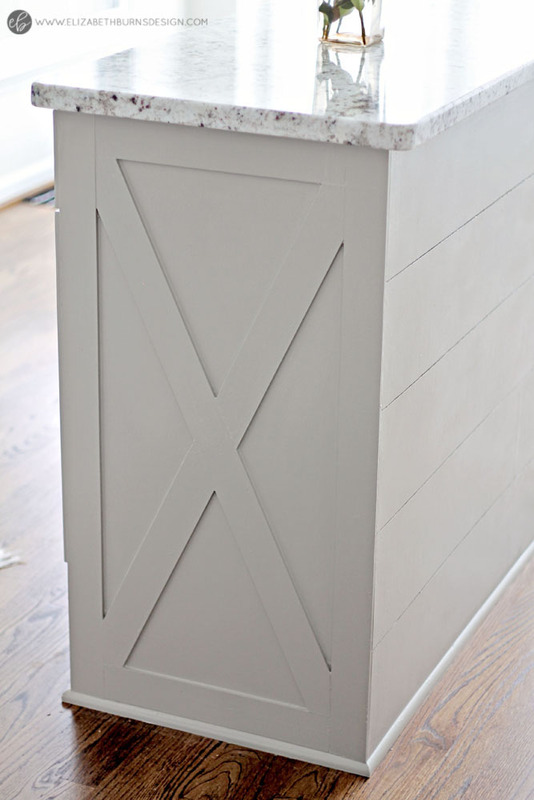 The gray island you see below is actually a vanity we added trim to and painted (just like we did for the vanity in the Avenue House flip). The smaller size of it may not seem like that big of a change, but now Brian and I can both be in the kitchen and move around each other comfortably where we couldn't before. I knew that I hated the black laminate, but was on the fence about what to replace it with. It felt kind of silly to replace laminate with another laminate (seemed like money down the drain) so after talking to our realtor and some other people who have bought in our area, we bit the bullet and went with granite. I was SO nervous I was going to hate it when it was installed (I really loved my farble counters, y'all) especially considering it was the most expensive purchase for the kitchen, but I really, really love it. We went with Snowdrift which was one of the highest levels (of course) but it has these really pretty gray and taupe undertones that are just gorgeous. It also has these specks of silver throughout it that look like shiny fish scales which shimmer when the light hits it just right. Laminate for this kitchen probably would have been around $500 if we installed it ourselves while the granite set us back $2600 (but did include a sink and labor) - ouch. I hope if we ever do move again, the granite sells the house, haha. For this kitchen, the design style I had in my head was "traditional meets French bistro with a touch of industrial" (that's a style, right?) ;) I also wanted to make sure that this kitchen was pretty low-maintenance. We went with brushed nickel hardware (from DLawless Hardware, of course) instead of chrome and light fixtures that couldn't collect dust like all of my pretty chandeliers did. I think the one regret I have with this kitchen is not going for fingerprint resistant stainless appliances. (If you have a stainless cleaner you love, help a girl out - my appliances are streaky no matter what I do.) Another big undertaking that isn't super noticeable in the photos is that Brian scraped the popcorn off of the ceiling! Having a smooth ceiling really does help bring this kitchen into the current decade, but it was no easy feat. Our house came with an eat-in kitchen which at first I thought was a waste of space, but now I kind of love it. Brian and I no longer eat awkwardly at the heads of our super long dining table when it's just the two of us, lol. We use this little bistro table for weekend brunches, evening wine, and as a place for guests to hang out at when we're cooking. It also gave me an excuse to purchase those cutie patootie black cafe chairs. P.S. The rug we use in that nook is indoor/outdoor! Perfect for us messy eaters and I love the contrast of it against the new hardwood floors. Another favorite finish of mine in this kitchen is the backsplash. 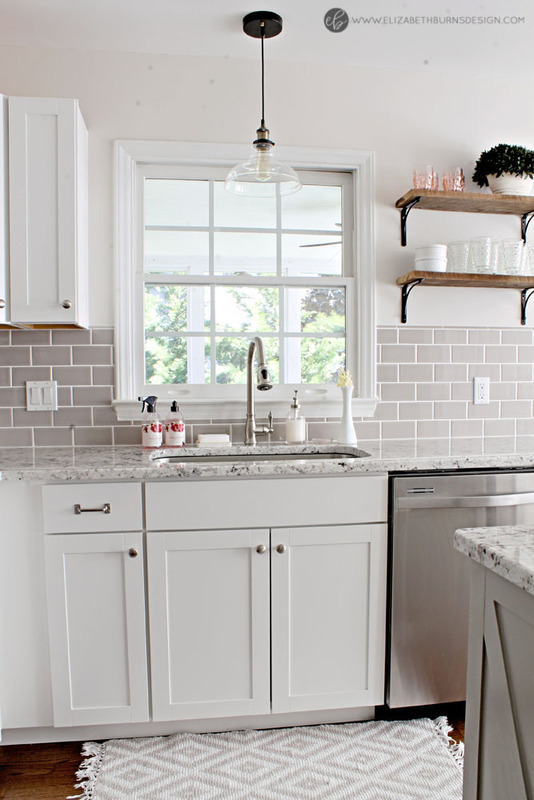 I didn't love the white subway tile next to the white shaker cabinets in our last kitchen because the cheap subway tiles are more off-white instead of pure white. Since we were keeping the walls, cabinets, and counters pretty light, I brought in this gray subway tile backplash to create a little visual interest. 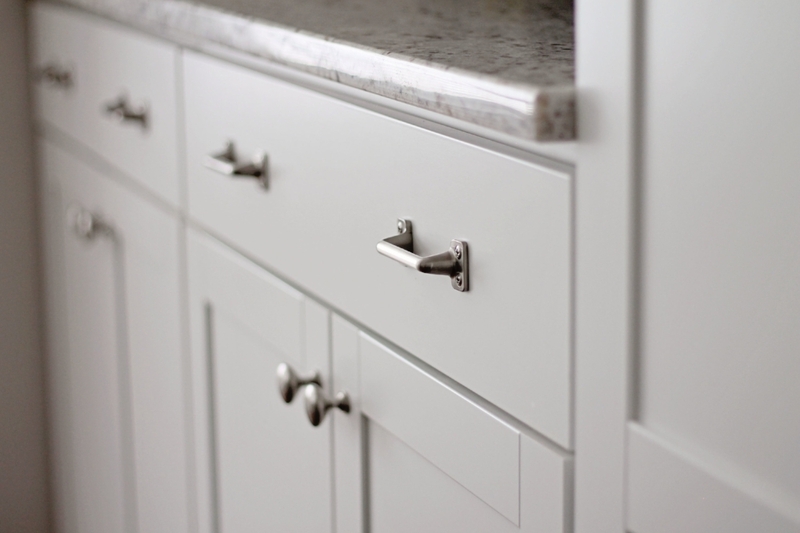 The gray has taupe undertones, but it pairs beautifully with our Snowdrift granite counters. I love the sheen it provides too - I think it helps make the kitchen feel a touch larger. 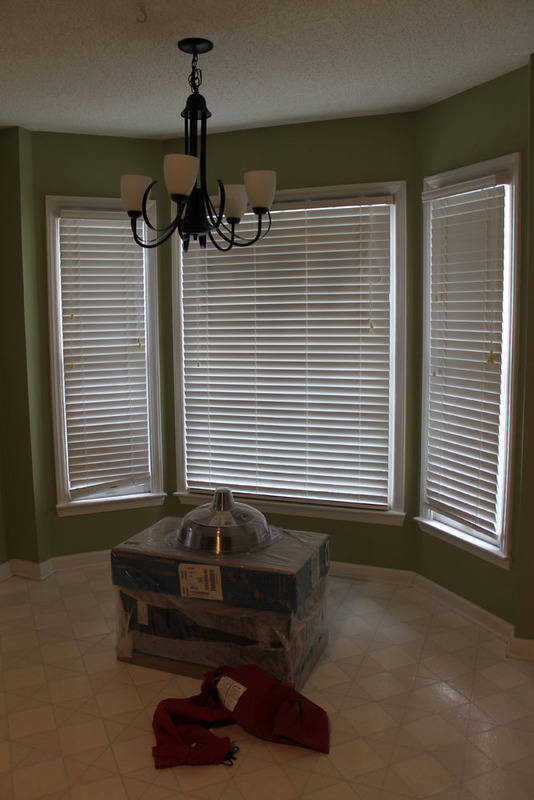 We were able to get in touch with the same company that installed the hardwoods in the rest of the house and had it added to the kitchen and powder room so that the hardwoods run throughout the first floor. It adds some warmth to the otherwise white room and I love how it ties into the barnwood on the open shelves. This is the last piece of salvaged wood from the Myrtle House barns! I love having a little piece of our old house in our new kitchen. I always feel a little guilty ripping out a perfectly functioning kitchen, but we were able to pass on the cabinets, counters, and appliances to a nice man via Craigslist so they'll be used again. We also saved a few cabinets to use in our garage. The only thing we ended up taking to the dump was the old vinyl floor, but trust me, it had lived out it's life to the max. We still need to add crown moulding and finish installing the shoe moulding in the kitchen, but I'd say we've come a long way! The kitchen is definitely our favorite room in the house now.